They say that revenge is a dish best served cold, but in The Revenant, Alejandro Gonzalez Iñarritu's followup to his Best Picture Oscar-winner Birdman, it's also one that can only be delivered after a great deal of patience and nearly an endless amount of torment. The brutal and unflinching Western is a powerful and transfixing rumination on the kind of punishment the human body can endure when on a mission for justice, but at just over two and a half hours, it languishes so long on all the gory particulars that it can't help but become repetitive and lose a little of its potency. Right from the outset, we're thrown headlong into the dangerous business of pelt trading in the 1840s. Hugh Glass (Leonardo DiCaprio) and a team of men, including his son Hawk (Forrest Goodluck), are out hunting when they are besieged by a tribe of natives in a battle scene that has all the visceral impact of the opening of Saving Private Ryan. The survivors of their group escape in a boat but, after concluding that they're sitting ducks, decide instead to cautiously make their way through the woods. It's then that Glass, while scouting ahead, is savagely mauled (and not raped, as The Drudge Report infamously and falsely reported) within an inch of his life by a bear. After tending to his wounds as best as possible, the group attempts to carry him over the rough terrain, but it quickly becomes too much of an arduous chore. The confrontational Fitzgerald (Tom Hardy) is in favour of simply putting Glass out of his misery, but is eventually talked into staying behind with the younger Jim (Will Poulter) by the group's leader (Domhnall Gleeson) to look after Glass and give him a proper burial if needed. But when Fitzgerald kills Hawk in cold blood and leaves the boy's helpless father alone to die, Glass musters the strength to begin the long, treacherous journey home in solitude. It's here that the movie starts to meander on episodic tangents, making a gruelling trek — beset at every turn by inclement weather, natural predators and the hostile natives that continue to track him — nearly as exhausting for the audience as him. As Glass continually finds himself in peril, there's little suspense to be found in his survival as we're all-too-aware that his death would signal a disappointing and unlikely end for the film. So, we're left then to simply marvel at the series of trials and tribulations he's forced to withstand, anxiously awaiting a bid for retribution that would perhaps be more impactful if the film established a connection with his son and deceased wife beyond superficial flashbacks and voice-overs that recall the works of Terrence Malick. Still, there's much to admire about the film. The cinematography by Emmanuel Lubezki, also an Oscar winner for his work on Birdman, continually captures the ragged beauty of the harsh landscapes in striking imagery. Hardy does superlative work in perhaps the film's trickiest role, donning an accent that's frequently difficult to decipher through his thick moustache and creating a captivating villain that's practically begging for his comeuppance by the end. 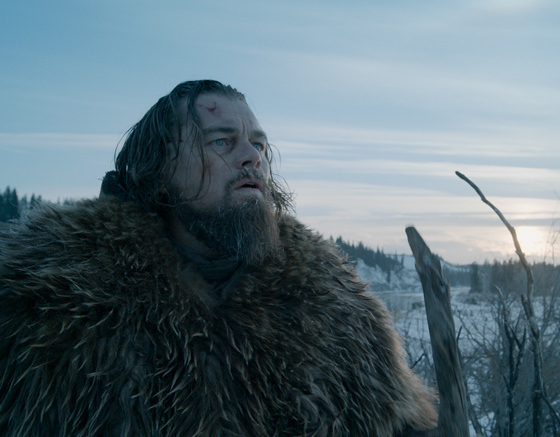 And though DiCaprio's role doesn't give him a lot of emotions (or dialogue, for that matter) to play beyond varying degrees of anguish and stoic determination, he throws himself into the role with astonishing commitment, carrying the film on his weary shoulders by making you feel every excruciating step of the long trip home. Throughout his trek, we can sense always in the hollows of his eyes a dim light that refuses to be extinguished, even in the face of near-certain death. He ceases to become man at some point; he's a persistent ghost hell-bent on a violent haunting.